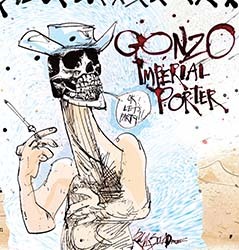 The Gonzo pours a dark black color with a small, frothy light-brown head. Aroma is of light perfume hops, and there is also a hint of beef and olives. Initial taste is moderately sweet with a light sweet finish. Feels light and creamy on the mouth with soft carbonation. TGWK says "It tastes like teriyaki beef jerky." MB says "It smells like Home Depot."